The French President Jacques Chirac has asked the French Parliament to pass a law banning the hijab in France. Hijab is an integral part of Islam, it is derived from Quranic injunctions and its practice is not symbolic or a fashion or cultural statement but rather it is a manifestation of being a Muslim and following the deen of Islam. An attack on hijab is clearly an attack on Islam. 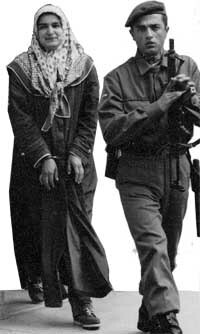 To criminalize hijab is to criminalize Islam. This is the intension of this law - to outlaw the practice of Islam. "It's a means to defend France & Europe against the spread of Islam"
Islamophobia is rife in France with polls suggesting that over two thirds of French citizens want a law to ban hijab. Already, even before the law has been approved by the assembly, many if not most state schools are unilaterally banning hijab. The French census does not sort residents by ethnicity or religion, but the estimated number of French Muslims is as high as seven million, or 11 percent of the population. And yet Muslims are excluded from all positions of authority and decision making, there is not a single Muslim in the 577-member French National Assembly, and there are no Muslims among France's 36,000 mayors. Muslims face the worst discrimination in society, they have the worst housing, and the highest level of unemployment. French politicians disguise their islamophobia by claiming the states secular ideals must be defended and cannot survive any religious sentiments. They say they are not discriminating against Muslims in particular but against all religions, for the protection of their secular ideals. And yet this same secular state observes all the Christian holidays but refuses to recognise Muslim or Jewish ones. Whilst private Christian schools receive subsidies from the government there is not a single state funded Muslim school. We call that hypocrisy. The first Muslim school permitted in France, Lycée Averroés, opened its doors in September 2003. It took eight years struggle for it to open with authorities turned down the first three applications to open the secondary school. Its running costs are met by private donors, the state will not fund it for at least the next five years. So great is the demand for persecution-free education among Muslims that they have been flocking to Catholic schools, which have not (as yet) drawn a distinction between a Catholic nuns habit and the Muslim hijab - permitting both on its premises. In Muslim areas Catholic schools now have up to 70% Muslim pupil populations. The Jewish father of two Muslim girls expelled from their school in the northern Paris suburbs for wearing headscarves has described the decision as 'scholastic apartheid' and vowed to launch an appeal. “The upholders of radical intolerance can be very satisfied,” said Laurent Levy, a human rights lawyer who describes himself as an atheist Jew. “My daughters only want to study and they have been stopped," he said on Sunday. The head of the Movement Against Racism (MRAP), Mouloud Aounit, described the explusion as "a crushing victory for intolerance." “It is a sign of the Islamophobia that reigns across France," he told the Journal du Dimanche newspaper. Lila and Alma Levy, aged 18 and 16, were suspended two weeks ago from the Henri-Wallon Lycee in Aubervilliers. They are now at home pending a full decision by the local education authority's disciplinary board - and themselves upset at they way they have been treated. "The secularists invoke the 1905 law separating church and state. But that was supposed to stop the French republic protecting one religion - Catholicism. It was a way of opening up religious freedom for individuals - not a statement of official atheism." The student body at the lycee is made up largely of Muslim immigrants. The girls will continue their studies at home. Lila hopes to qualify for university where the ban on headscarves does not apply. Thousands of Muslims girls are being denied education. They are being expelled from school if they follow their religion and wear hijab. 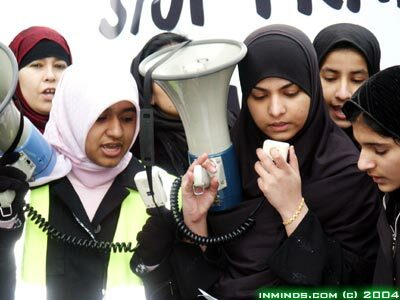 Shamefully it has been teachers who have led the campaign to refuse education to Muslim girls. Teachers in the small town of Flers even went on strike when a 12-year-old pupil refused to remove her headscarf . Amazingly, almost without exception, all the 70 staff at the school objected to the little girl wearing hijab (Jean Monnet Junior High School, Jan 1999). 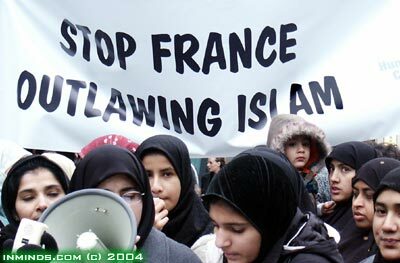 France has even tried to impose its xenophobic practices in Muslim countries. The Champollion School in the Egyptian city of Alexandria, which is a subsidiary of a French NGO, expelled a 12 year old Muslim girl last October because she began to wear hijab. Then as further punishment they expelled her three brothers from the school. When the family went to court to seek justice, the French consulate intervened with the court on behalf of the school and asked the court to consider the school officials as ‘diplomats’ who could not be tried under Egyptian law. The judge rejected the absurd claim and awarded damages to the family. It was later discovered that the school didn't even include Arabic in its syllabus! Imagine if a Muslim school in France refused to teach French! Jacques Martin, mayor of Nogent-sur-Marne (suburban Paris), a member of President Jacques Chirac's conservative UMP party, has insisted that from November 2003, that if a Muslim woman wishes to marry she must first go against her beliefs and remove her hijab, only then can she enter a civil weddings at her city hall. Couples marrying in France must be wed at a civil ceremony at their local city hall as the state does not recognise religious weddings. Interestingly only Muslims are banned from wearing a veil in city hall, Christian brides are permitted to wear their wedding veils without hindrance. 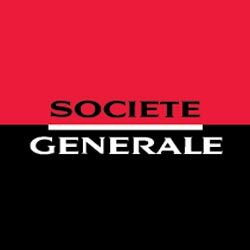 The French bank Société Générale has admitted to turning away a Muslim woman from its branch in Paris on Monday, December 22 2003, after she refused their demands to take off her hijab. Further more the bank has refused to apologise, saying that the "over-zealous" security guards were following orders to deter robbers. Interior Minister Nicolas Sarkozy, in April 2003, insisted Muslim women be forced to remove their hijab for identity card / passport photographs citing a 1999 ruling. 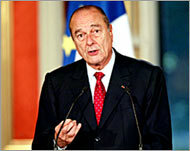 President Chirac in a televised address stated that Muslim women will now be prohibited from requesting a female doctor treat them even if one is available. 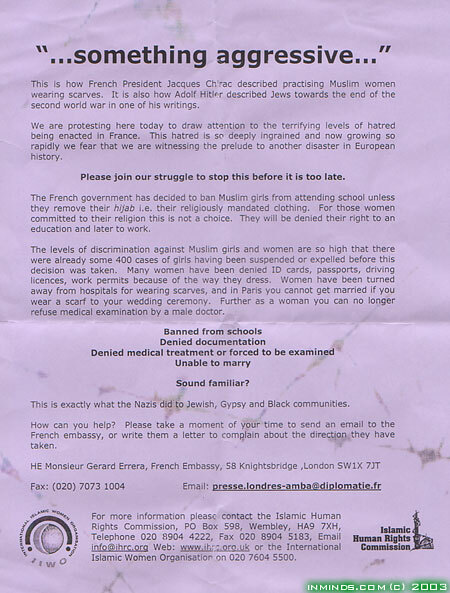 A French doctor has put up a sign, reminiscent of the "No Blacks" and "No Jews" signs of previous shameful times, which reads 'I refuse to treat veiled women' in the waiting room of his Paris-based medical clinic. Further, it demands that Muslims women remove their hijab before entering his clinic. The doctor explains "I was shocked due to the increasing numbers of veiled women in our neighbourhood... living in France necessitates... that women should not wear Hijab." (IOL 24 Jan 2004 & Reuters 5 Jan 2004). President Chirac has insisted that private businesses should be allowed to ban their Muslim employees from wearing hijab "for reasons of security or client contact" and sack them if they don't abide with the ban. France's justice minister, Dominique Perben, said on Nov 25 2003 that he personally had decided to replace a woman juror who wore her Islamic headscarf in court, saying he wanted to ensure a fair trial. The woman was to have been a juror in a trial in Bobigny, outside Paris, for the attempted murder of two police officers. Jean-Pierre Brard, the mayor of the Paris suburb of Montreuil-sous-Bois, has banned two fashion shows because they featured hijabs (Oct 4 2004). "Ready to wear for Muslim Women", a women-only event was organized by the "Jasmeen" label. The list of legalised persecution of Muslims in france today has an uncanny resemblance to laws introduced by the Nazis to hound Jews out of society, in preparation for the death camps. At that time it was the Vichy government in France that willingly collaborated in genocide. Today it is Chirac who has given his blessing to the anti-Muslim laws that are to be voted in the French assembly next month. In September 2003, after a five year battle, Germany’s highest court in Karlsruhe finally ruled that school authorities in the southern city of Stuttgart were wrong to sack a Muslim woman from a teaching job because she wore a headscarf in the classroom. But the court also stated that although Germany’s constitution did not forbid the wearing of headscarves in state-run schools, individual states could impose such a ban if they wished. On October 10th 2003, seven out of Germany's sixteen states backed legislation barring hijab at a meeting of the 16 regional ministers for culture, education and religious affairs. Already two of these states - Bavaria and Baden-Württemberg have drafted bills which, if passed, would prohibit teachers in state-funded schools from wearing headscarves. The bills will be sent before their respective state parliaments for approval early in the New Year. In an interview with Germany's Bild am Sonntag newspaper (21 Dec 2004) Chancellor Gerhard Schroeder supported the ban on hijab by saying that "headscarves have no place among people who act on behalf of the state, and that includes teachers". Update April 2004: The German state of Baden-Wuerttemberg has banned Muslim women teachers from its schools, State culture minister Annette Schavan was quoted as saying "headscarves have no place in schools". The state assembly approved the law almost unanimously. Another five out of 16 states are in the process of passing similar bans. Belgium is seeking to emulate France by planning to ban religious symbols from its own courts, schools and offices. Backing the controversial French legislation that seeks to ban the Islamic hijab and other religious symbols from schools, Deputy Prime Minister Patrick Dawael has called for a similar law in Belgium. "We should do the same thing about it in our country," Dawael said in a letter reprinted in Belgian newspapers (11 Jan 2004). He argued that civil servants including schoolteachers, judges and police officers should be banned from wearing hijab while at work. The same rule should apply to pupils in Belgium's state schools he added. In September 2003 a french speaking school in Laken, near Brussels, in which the majority of the pupils are Muslim, banned its girls from wearing the hijab. 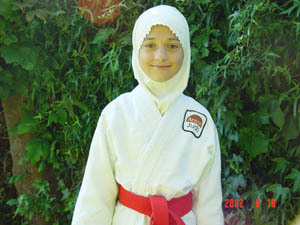 In December 2003 two Belgian senators, Socialist Anne-Marie Lizin, and Liberal Alain Destexhe, presented a draft law to the Senate to ban hijab in all state schools. Public hospitals throughout Brussels' Iris group (5 hospitals) are to ban the wearing of hijab by their staff (6 Jan 2004). Many private hospitals have already adopted such a ban. Some Belgian medical schools have taken a similar approach, with the Free University of Brussels banning women from wearing hijab during practical exercises and while undertaking practical training within a hospital environment. Even when there is no law present, local authorities are trying to pursue islamophobic practices. Authorities in the town of Vise refused to renew a Muslim womans identity card saying they would only provide a new card if she removed her hijab for the photo. Only after she took them to court and won (15 Jan 2004) was she permitted her identity card. “The point of a photograph on an identity card is to identify, as its name suggests, the holder. That means that the picture should be as close a likeness as possible to the normal appearance of the cardholder, and in this case that means a young woman who always wears an Islamic veil,” the court ruled. A Muslim supermarket cashier in Copenhagen was sacked after she chose to wear hijab. 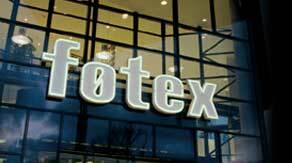 Her employer, the Fotex supermarket chain (part of Denmarks second largest supermarket group DSG) said her headscarf breached its dress code which forbids all religious symbols. Her trade union HK disagreed and sued Fotex on her behalf for unfair dismissal under Danish anti-discrimination law. Astonishingly the high court, ignoring the European Human Rights Convention, ruled against the cashier (18 Dec 2003). It was revealed that the ruling came a day after DSG lifted a ban on another type of headgear - Sant Claus hats. Jorgen Hoppe, HK director pointed to the hypocrisy "its thought provoking that workers are allowed to wear Santa hats to mark a Christian holiday." 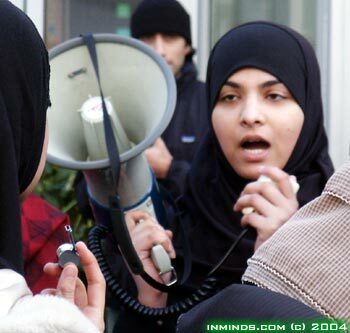 In the past (Aug 2000) when a 16 year old school girl won her right to wear hijab at work after taking her employer, Denmark's largest department store Magasin Du Nord, to court, the Prime Minister intervened and attacked the court ruling in a tabloid newspaper: "The court decision in favour of a Muslim girl can have consequences. I will advise these girls not to wear these scarves." In the media debate that followed both the right and left wing joined forces in attacking Denmark's Muslim minority, cautioning them not to demand too much and instead accept the prevailing norms of the host society. The Miele & Cri-Cri kindergarten in northern Samone banned a Muslim teacher for wearing a headscarf saying it might "scare" the children (March 2004). 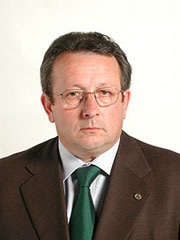 When the Interior Minister Giuseppe Pisanu criticised the ban, the Northern League, a coalition partner of Berlusconi's government, attacked the hijab. "If someone comes from the jungle and is used to going around dressed like Tarzan, they can do it there, but not here," Northern League senator Roberto Calderoli said. The Northern League is also pushing for a law that would require a referendum every time a request is made to build a mosque in Italy. In the town of Drezzo Muslim women wearing a nikab (face hijab) are being given penalty tickets by the police - like parking tickets - every time they are seen in public wearing their nikab (Sept 2004). Mrs.Sabrina Varroni, a mother of four and a convert to Islam, has already been fined $100 (40 euros) for appearing twice in public wearing nikab - once when collecting her children from school. The Northern League mayor, Cristian Tolettini, has interpreted Mussolini's fascist 1931 law banning masks as referring to Islamic dress. Not satisfied with the ruling, Cesarino Monti, a Northern League senator, has proposed an even tougher one: a fine of up to 5,000 euros and up to six months in jail for Muslim women caught wearing nikab. A Spanish state-funded school refused a 13 year old Muslim girl entry because she wears hijab. Delia Duró, the principal of the Instituto Juan de Herrera school in the town of San Lorenzo de El Escorial, said hijab was "a symbol of submission of women" which "violates citizens' civil rights." Interestingly the school is run by Catholic nuns! The Education Minister, Pilar del Castillo, supported the ban and argued that the hijab is not a "religious symbol but a sign of discrimination against women" and added that she was prepared to legislate over the issue if necessary. The Minister for Labour and Social Affairs, Juan Carlos Aparicio, went further comparing the desire to wear hijab with the unIslamic practice of female circumcision, describing them both as "savagery" (Feb 2002). Whilst the race-relations law in Britain protects other religious minorities like Jews and Sikhs from discrimination, it specifically excluded Muslims. Muslims unlike the other religious minorities are racially diverse and cannot be defined in terms of race, and so the excuse goes, are left unprotected by the law. 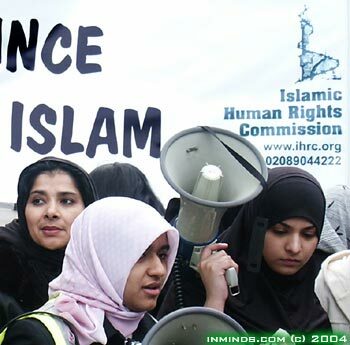 Even after a decade of lobbying, and with independent academic studies, like the Runnymede Trust report on Islamophobia, all advising government of the need to provide equal protection under the law for Muslims, successive governments have all refused to do so. This loophole in the law has lead to horrendous discrimination of Muslims in all sectors of society including schooling and employment. Shabana Katisar, 16, who is in Year 11 at Icknield High School, said many girls wanted to wear the hijab but were prevented by the school. She said she wears the hijab to school and removes it when she enters the premises. On the occasions that she has kept the hijab on in school she, and other girls, have been placed in isolation. She said: " It has happened many times. Last year, Sadia, who is a year ahead of me, came into school wearing hijab. She was isolated for two days. Her parents moved her to another school where they are allowed to wear hijab..."
"Sikh boys are allowed to wear a turban even though it is not part of the uniform. This is because they are protected under law but we are not because we are Muslims." Ms Kausar has discussed the issue with her Head Teacher, Keith Ford, but has been told to remove the hijab or face continued isolation. She has also spoken with the Equal Opportunity teacher: " She is sympathetic to us but she told me she cannot do anything as the Head Teacher has the final say." Mr Ford acknowledged that two pupils were placed in isolation and said the "head scarf is not part of the uniform." When asked why Sikh boys are allowed to wear the turban when it is not part of the uniform, Mr Ford replied: " we took legal advice and were told that Sikhs are protected by law. I am not going to break the law." Whilst the government had denied any plans to outlaw hijab, at least one MP, Dr Evan Harris*, a Liberal Democrat MP for Oxford West and Abingdon, has vocally supported the hijab ban. 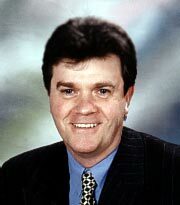 On a BBC radio programme (29 Jan 2004) he compared hijab to a fashion accessory and said schools are entitled to ban them. 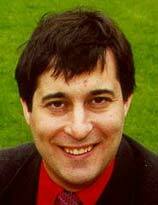 Evan Harris is also the honourable secretary of the National Secular Society**. When the interviewer asked him "is this ban not against the fundamental human right of freedom of religious practice?" he replied "no it isn't because it doesn't interfere with the right of religious practice, schools are for learning not for practicing religion". No doubt he would use this same secular fundamentalist argument to ban hijab from hospitals, places of work and all other public areas. Action Point: A model letter is available to send to the lib-dem leadership demanding that action be taken against Evan Harris for his discriminatory outburst and for official lib-dem policy to be clarified. * Muslim voters should also note that Dr Evan Harris is the Treasurer of British-Israel Parliamentary Group and in June 2000 he was part of a "Liberal Democrat Friends of Israel" visit to Israel which was funded by the Israeli government. "Secularism is under sustained threat from a resurgent Islam - and not just in France. In this country, too, it is becoming difficult to even discuss minority religions in critical terms without landing in trouble. We need to resist. We can only do that if we are an organisation with a significant body of support. That's why we need you to join. We will never be taken seriously unless enough people are prepared to stand shoulder to shoulder and make this a movement to be reckoned with. You can join, (£15 individuals, £23 couples, £9 unwaged) or make a donation online using The Royal Bank of Scotland's secure server here (or send a cheque or postal order to..."
For Muslims this is a time to mobilise - a time to act. First we must understand that we are facing this struggle in France because we failed to act when it happened in Turkey. Our sisters in Turkey are currently facing long prison sentences simply for daring to wear hijab - hijab is treason in Attaturks secular republic - and yet the Muslim world is silent. We in Europe are perhaps in a position to wield greatest influence on a Turkey begging to be included in Europe and yet we have failed them. Lone groups like the Islamic Human Right Commission have been left on their own to take up the challenge. Whilst their work is commendable, but without support its like throwing a pebble in to the sea to stop the wave of secular fascism that is sweeping Europe. We must understand that we are all in this together - its not a Turkish problem nor a French one - its our struggle. The frontline happened to be Turkey - we lost, so now its moved to France and Germany, with the rest of Europe ready to fall if we lose again. And remember as with Nazi Germany, the legalisation of anti-Muslim laws is the just the first step towards their objective, their 'final solution' to achieving a Europe cleansed of its Muslim population. Recent weeks have seen at least three demonstrations outside the French Embassy in London (you can read about one of them below), and this Saturday (17th January 2004) there will be coordinated action across the whole world against the french hijab ban including two more demonstrations outside the French embassy in London (11 am, 100 yards from Knightsbridge underground station), and a march starting at Marble Arch at 11.30 (going to the Embassy). These demonstrations at this time are crucial in pressuring the french parliament before it decides next month whether it can get away with passing such discriminatory laws. Please ensure that you do not miss this opportunity to stand for justice, for Islam. 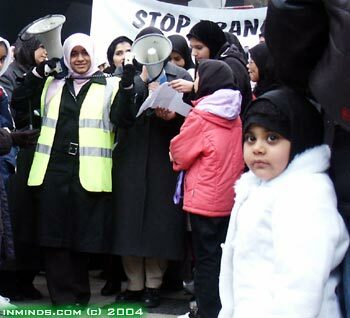 Update Feb 2004: See our new page on the 17th January 2004 Hijab Protest, it included over 20 audio speeches. 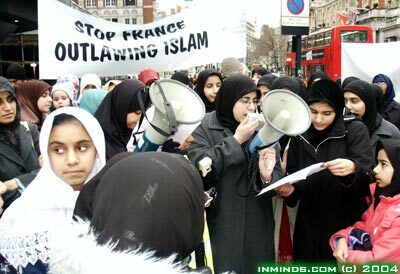 The Islamic Human Rights Commission (IHRC) and the International Islamic Women’s Organisation (IIWO) organised a demonstration outside the French Embassy in London, UK on Sunday 11th January to protest the ban on religious clothing in French schools and the increasing persecution of Muslim women in particular. The demonstration was suitably loud with well chosen slogans carried on a drum beat, resonating through the street to their targets in the French Embassy. “Not only are Muslim girls and women forced to choose between their right to religious freedom and their right to an education and work, they are currently being harassed and discriminated against by various sectors of French society and their rights to marriage and equal treatment violated. “We have had report after report of institutionalised discrimination from immigration controls, passport agencies, to employers. The new stance of the government not only includes schools but no longer allows women the right to refuse examination by a male doctor. Currently Muslim women wearing scarves to their wedding ceremonies in Paris will be barred and their civil contract not performed. 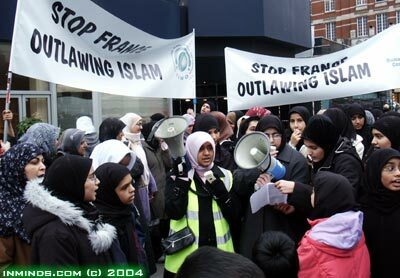 It seems that the French policy is simply to persecute Muslim women and force them to abandon Islam. We are writing to you today with deep sadness to protest your government’s actions subsequent to the reporting of the Stasi commission, but also the effect that your government’s specifically anti-Islamic stance has had on wider French society. The arguments put forward by politicians in your government and parliament as well as other actors on this issue are well-rehearsed. We would briefly like to address a few that have been raised. Your government has claimed that the secularism you are enforcing somehow ensures respect for all creeds and beliefs and equal rights for all. How can this be the case when such a ban and indeed the similar bans that prevent women wearing a scarf from having a civil marriage ceremony, passport and ID cards discriminate against Muslim women in the enjoyment of French citizens’ rights. Your government’s and institutions’ actions have violated their rights to an education, work, free movement and free religious expression. Whilst the school ban ostensibly also targets Christians and Jews, the Islamic dress for women differs in that it is a mandatory part of the Islamic faith. 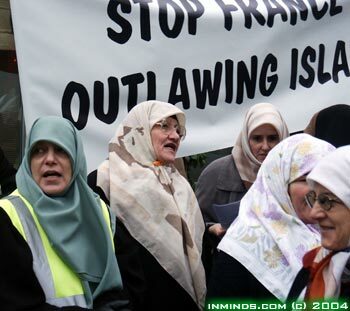 The French state’s attempts to force women to abandon their religious practice is the every antithesis of freedom and equality. If anything it evidences a fanatical desire to control women’s minds and bodies. Many concerns have been raised about so-called integration of minorities into French society and social cohesion. How can you possibly have an integrated or harmonious society when you are forcing whole communities of women to its margins? Already we have reports of hospitals denying Muslim women treatment. Those who are allowed in will be forced according to the Stasi commission’s recommendations to be seen by male doctors even if they don’t want to be examined by a man. Your political classes have made noises regarding these measures as somehow designed to promote women’s rights. This is an affront to the common sense and ethics of every principled human being. Not only are these actions anti-Islamic they are misogynistic. Further you are not only violently excluding Muslim women, and denying them their agency by deciding what you believe to be best for them and / or French society as if they were not part of it, you are demonising Islam and Muslims in a catastrophic manner. When Bernard Stasi himself has been quoted as saying that the new law is meant to counter ‘forces that are trying to destabilise the country' and that, 'there are indisputably Muslims or…groups seeking to test the resistance of the Republic, that bear a grudge against the values of the Republic, that want France to no longer be France' you are casting Muslim women and Muslims in general in the role of the enemy within. We do not need to remind you of Europe’s recent history and the last time when this was done to a minority community in a European country. Just as you described Muslim women wearing hijab as “something aggressive” so too did Adolf Hitler describe the Jews of Europe. We urge your government to halt its steady but sure course towards a violent fascism that can only lead to disastrous consequences. There were several reporters and TV crews at the demonstration including from Reuters, Socialist Workers Party and IRNA (Iranian TV). LONDON (Reuters) - A crowd of Muslims have protested outside the French embassy in London in anger at French plans to ban Muslim headscarves from public schools. 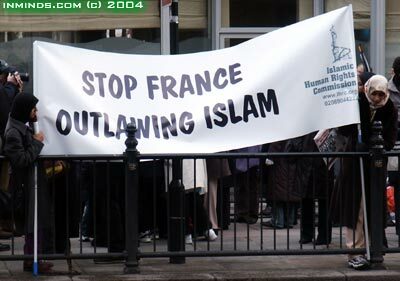 More than 100 people chanted slogans and raised banners saying "Stop France outlawing Islam", before delivering a letter addressed to French President Jacques Chirac to the embassy, urging him to stop the ban. "The scarf is not a fashion statement. It is compulsory for practicing Muslim women. People are being denied basic civil rights and forced to make an unacceptable choice," Massoud Shadjareh, Chairman of the Islamic Human Rights Commission, which organised the protest, told Reuters on Sunday. Chirac has angered Muslims by calling for a law banning all overt religious symbols from France's secular state schools, including large Christian crosses, the Jewish skullcap and the Muslim headscarf. The protest comes ahead of a planned protests on January 17 in London, Paris and other European cities. ANGER IS growing over the French government's plans to ban the Muslim headscarf, known as the hijab, from schools. The plan is to ban all "overt religious symbols" from schools. But the debate has shown that it is clearly directed at Muslims. In December last year France's right wing president whipped up anti-Muslim sentiment by claiming that there was "something aggressive" about the headscarf. The proposed ban has sparked anger beyond France. Around 75 people, most of them young school students, attended a noisy protest outside the French embassy in London on Sunday of last week. "We are outraged that anyone could support these policies. This kind of demonisation of a section of the population is unacceptable in this day and age. Already women wearing the headscarf have been denied passports and civil marriages in France. 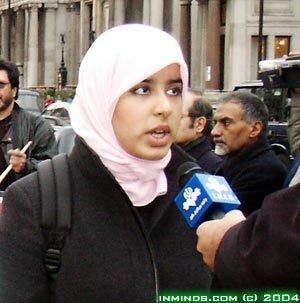 In Britain some schools don't allow Muslims to wear headscarves. The so called war on terrorism has been used by Islamophobes who want a war against civil liberties." "Icknield High School in Luton have stopped girls from wearing hijab. This could bring conflict between people. And it will affect other religious groups too. Today it is the Muslims but it will be someone else next. Most people think that the hijab oppresses women, but it doesn't-no one forces us to wear it." "Most of the people there, including those who are not Muslims, think that we should have a free choice. We are not forced to wear hijab-our parents don't force us to wear it." Another protest was set to take place on Saturday of this week, called by the Muslim Association of Britain and the Muslim Women's Association as part of an international day of protest. Lynne Hubbard from Birmingham told Socialist Worker, "A motion was passed at Birmingham Trades Council on Thursday of last week. The motion supported the demonstration, opposed the attacks on Muslims and defended the right of women to wear the hijab. Five coaches from Birmingham have already been booked to attend the protest at the French embassy." Join the protest on Saturday 17 January, 12 noon, French embassy, 58 Knightsbridge, London SW1 (Knightsbridge tube). The Stop the War Coalition is supporting the demonstration. 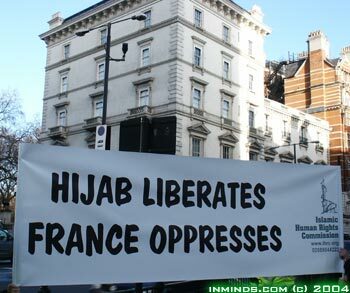 Banner (left) reads "Hijab Liberates, France Oppresses"
exploited - objectified woman is given the accolade of "free" and "liberated"
she is deemed "aggressive" and society must be protected from her presence! She must be punished, forced to de-robe or be outlawed! The Islamic Human Rights Commission have organised a letter writing campaign in regards to this issue. Sample letters, courtesy of IHRC, are provided below - please make copies and distribute them in your community. I write with regard to the decision by the French authorities to ban ‘ostentatious religious symbols’ in schools. Clearly any such ban will violate the European Convention on Human Rights, as well as other international documents and standards. This will violate the rights of many religious people and I am further distressed at the amount of vilification that has been levelled against Muslims and Islam by French politicians in recent weeks regarding the ‘hijab’. This ban would also be a discriminatory blow to Muslim women forcing them to either violate their religious principles or quite simply stay at home. In point of fact the proposed requirement for Muslim women to remove clothing is a violent abuse of their rights and cannot be sanctioned by any government respecting human rights. I am further concerned regarding the implications for British citizens who reside in France and whose children attend schools there. I trust your office is taking the necessary steps to defend their rights in this matter. I look forward to hearing from you shortly regarding the immediate action you have taken in this matter. I write with regard to your backing of the banning of ‘ostentatious religious symbols’ in schools. I urge you to reconsider your decision as this ban would violate all human rights standards including the European Convention on Human Rights. Your own statements regarding the ‘hijab’ or headscarf of Muslim women as ‘aggressive’ are very worrying. This ban will demonise religious people and in particular Muslim women. Any such action on the part of the French government will not simply alienate Muslims in France and world-wide but all those who believe in equal and full rights for women and minorities. Just as you have spoken out in recent weeks against anti-semitism you must tackle this growing Islamophobia and anti-Muslim hatred in French institutions and indeed the government. The recent comments by French politicians that the hijab is a symbol of oppression make little sense when so many women in France are saying they choose to wear it because they feel liberated. Forcing them to remove it will be an act of violence against them, and violates their right to free religious expression, education and work. Likewise those Jewish and Christian adherents to their faith who have been targeted by this ban will suffer similar violations. I look forward to hearing from you shortly regarding this matter. Participating on a BBC Radio Five Live discussion on 29th January, Liberal Democrat MP for Oxford West and Abingdon, Dr. Evan Harris defended the French ban on hijab in schools. Please write to the Liberal Democrat Leader Rt. Hon. Charles Kennedy MP asking him to take immediate action against Evan Harris for supporting a ban that will violate many basic rights, and to clearly state that the Liberal Democrats oppose such a policy. I am deeply offended by the abhorrently prejudiced opinions expressed by your MP Dr. Evan Harris in a recent radio debate on Radio Five Live. Dr. Harris has strongly supported the French government’s decision to ban hijab (Muslim head scarf) from schools. Based on his enthusiastic support for this policy it is clear that he would like to see such a ban enforced in the UK also. The French ban is a clear violation of basic human rights. It will violate a Muslim woman's' ECHR rights to an education, subsequently it will impinge on her right to work and obviously it prevents her from the free expression of her religious beliefs. This will either force Muslim women to the margins of French society or force them to violate their own principles to enjoy what should be their basic rights to education and work. Already the the proposed ban in France has resulted in an upsurge of anti-Muslim discrimination. Currently Muslim women are refused a civil marriage ceremony in Paris unless they remove their scarves, hospitals and clinics are refusing to treat Muslim women unless they do likewise. Other women have been denied access to shops and banks. Is this what the Liberal Democrats wish to see in the UK? Certainly based on his remarks, Dr. Harris sees little wrong with this scenario. Dr. Harris remarks are an affront to universal human rights and the enjoyment of basic rights by religious groups. I trust that he will be reprimanded and ask that strong action be taken by your office against him. Before recent events your party was viewed as one that acted on principle and less prone to be swayed by opportunistic and often unethical lobbying. Swift action on this matter may help to restore part of the damage done to this view. Your failure to deal with this issue will sadly evidence that you believe these views to be compatible with Liberal Democrat party policies and principles. Hijab Ban: An Attack On Our Daughters, a lecture by Sr.Sukeina from inminds, looking at whats behind the hijab ban in schools. 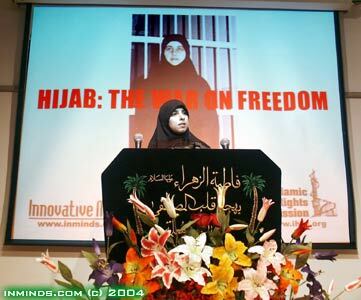 Hijab: The War On Freedom, a lecture by Sr.Sukeina from inminds, presented at the AhlulBayt Islamic Mission Conference 7 April 2004.